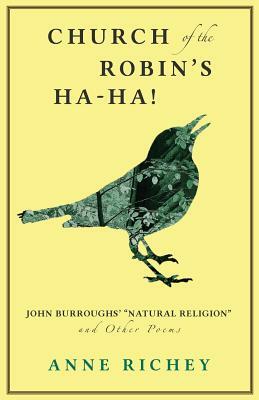 Church of the Robin's Ha-Ha , the title poem of this collection, underscores John Burroughs' essentially religious connection to nature. For the famed Catskill naturalist and writer, "heaven on earth" was no mere clich , but a reality. His parents' Calvinist preoccupation with the heaven to come, seemed to him tragically misguided and counter-productive. Still, as Anne Richey reminds us, Burroughs' love for the earth was tempered by eyes determinedly wide open: yes, bird song enchants us, but somewhere a snake is devouring a baby bird. In other poems, all set in the Catskills, Richey keeps faith with Burroughs' devotion to the near-at-hand - the sunlit and the dark: a doting mother photographs her two boys, a dog cowers in fear, a man appears to walk on water . . .